Colorado PRI meet up! Join fellow PRI addicts for our quarterly Colorado gathering. Lisa Kelly PT, PRC will review the recent vision course and Craig Depperschmidt PT, PRC and Scott Kosola PT, PRC will reveiw manual techniques and when to use them. There should be plenty of time for discussion as well. 9a.m.- Noon on Saturday, October 25th at Rebound Sports and Physical Therapy in Fort Collins. Address is 2211 S College Ave #300, Fort Collins, CO 80525. Email Craig at craig.depperschmidt@reboundsportspt.com with any questions. 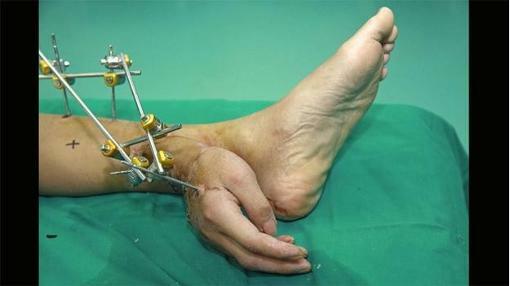 For those wondering, the picture is relevant because it shows a technique not often considered for the condition treated: keeping a severed hand alive by grafting it to the patient’s ankle, then later replanting the hand back on his arm. Upon evaluation, Don reported that these left shoulder symptoms started about 2-3 months after we discharged him from PT intervention in spite of his persistence with his HEP and “it was all back to the starting point three months later.” He still tested as a bilateral brachial chain patient with a PEC pattern, again was positive with impingement tests—Hawkins-kennedy, empty can, Neer sign. He was frustrated, unable to work in his wood shop or play his accordion for more than 10 minutes without severe pain. At this point, the patient and I discussed that fact that I had let him down to a degree because I wanted to take a different approach before surgery, but didn’t want to irritate Don or his referral source. He understood, accepted my apology and we moved forward. During the first 3 visits, we established that his bilateral brachial chain pattern and according left shoulder dysfunction was not the root of his dysfunction, but rather the manifestation of a “bottom up” pelvis patient whose primary difficulty was in maintaining frontal plane position of his pelvis. The key to Don’s left shoulder function? Right posterior inlet inhibition of his pelvis. During the seven visits we treated Don using a PRI approach after the gold standard of orthopedic medicine and orthopedic physical therapy had failed to maintain his shoulder function for more than 3 months, his symptoms resolved. He left the clinic a reciprocal, alternating, smiling woodshop athlete with bilateral HADLT tests of 4/5 at 72 years of age, “tickled” that he could play his accordion as long as he wanted without pain for the first time since before he first went to see the doctor more than two years prior. Don is in occasional contact for the past 6 months with no return of symptoms, lots of activity and happy thoughts. Six-month follow-up with no return of symptoms after the rest of my conservative clinical skills, an appropriate surgery and present day gold-standard postoperative care was unsuccessful. These are the types of outcomes that keep my passion for this science alive and accelerating. Moreover, these are the types of patient successes that remind me to be gentle but bold about intervention that I know clinically to be the most effective tool I have in the entire tool chest. Clearly, each patient is different, and no, I have not seen a consistent correlation over time between the diagnosis of left shoulder bicipital tendinosis and the need for right posterior inlet inhibition. The objective tests guided me to find the appropriate treatment, not my innate ability to hear the pelvis or shoulder speak to me. Thank you for reading, perhaps you can save a few visits for a few of your patients by way of my experience with Don. My best to you! It is with much excitement that we announce that chiropractors are now eligible to apply for the Postural Restoration Certified (PRC) credentialing program. This discussion began several years ago, and with an increase in interest from the chiropractic community more recently, the PRI Board of Directors made the decision to extend an invitation to chiropractors to apply for the PRC credentialing program. The Postural Restoration Certified (PRC) credentialing program began in 2004 and since that time, 123 physical therapists, occupational therapists and physical therapist assistants have been PRC credentialed. CLICK HERE to view the PRC requirements and to download an application. PRC applications are due on September 15th, and is limited to the first 30 applicants. PRC testing takes place in Lincoln on December 8-9th, following our Advanced Integration course. If you are interested in applying for PRC or if you have any questions about the credentialing program, please feel free to email me! I have the benefit of being associated with some outstanding thinkers and PRI practitioners. Whenever and wherever we get together, conversation eventually drifts toward discussion of PRI principles and application. One of our greatest challenges has been to unravel the foundations from which Ron Hruska evolved the Postural Restoration Institute system of evaluation and treatment that we all utilize with such great success. The following are just a couple of questions that we have posed and our attempts to reach conclusions and greater understanding. If anything it may stimulate some thought and initiate some discussion. What are we actually measuring when we place a patient on the treatment table and perform our PRI testing algorithm and what is our goal for treatment? I clearly recall a conversation over lunch between Eric Oetter, Mike Robertson, and myself during the PRI Pelvis Restoration course at the Cantrell Center for Physical Therapy and Wellness. We were discussing the concepts of adaptive capacity, adaptive potential, movement variability, what we are actually measuring when evaluating a patient on the treatment table, and how this affects performance. Our conclusion was that what we are actually measuring as PRI-educated therapists and coaches is the capacity of our client/athlete to adapt to the ever chaotic nature of the environment they are perceiving. Positive findings during examination such as a positive Adduction Drop Test, limited apical expansion, or loss of shoulder rotation was merely indicative of a human system incapable of demonstrating variability ultimately controlled by the central nervous system. More specifically an autonomic nervous system shift toward sympathetic dominance. In essence, what the researchers found in the study was that pain-free subjects demonstrated variability in the muscle activity of the erector spinae during a repetitive lifting task and those with low back pain did not demonstrate this variability as well as experiencing increased pain during the task. The authors’ conclusion was that reduced variability of muscle activity may have important implications for the provocation and recurrence of LBP due to repetitive tasks. Needless to say, this study is somewhat validating for our discussion group of PRI faithful. Truth be told, after searching there are many studies that support our lunchtime conclusion; and movement variability as a favorable concept in human function is not a new concept having its foundations in dynamic systems theory. What the PRI model provides is a non-invasive real-time measurement of system variability determined by autonomic nervous system tone. While EEG, heart rate variability, or galvanic skin response may be preferred methods to determine autonomic tone, these are not tools commonly used by a practicing physical therapist in a clinical setting or a coach in the training room nor would they be practical. The goal of treatment then becomes restoring an optimal level of variability to the system to allow for optimization of behavior and maximization of performance. "Restoring variability to the human system is the ultimate goal to promote neuroplastic change creating a relatively permanent change in behavior that provides adaptability within the system to cope with variability in the environment." In PRI terms, our goal is help a patient achieve neutral (restore variability) and then recruit the appropriate PRI planar families (neuroplastic change to remap the three planes in the brain… Thanks to Zac Cupples!) to restore reciprocal and alternating movement (change behavior to cope with the environment). How did Ron Hruska arrive at the concept of using simple, common orthopedic tests as effective PRI measurement tools? As mentioned above, as physical therapists our measurement tools are limited by practicality. If we look at PRI from a strictly biomechanical perspective, the PRI methodology provides for a low barrier of entry to a PT who has never been exposed to its concepts before. Myokinematic Restoration looks, sounds, and feels like biomechanical course, but we all know that it is not. This is a brilliant way to provide understanding to a group with more than a few preconceived notions, right? While I certainly cannot speak for Ron, and I’m willing to be wrong, I believe there is more to this process, and this came from a conversation I had with Eric Oetter over Sunday breakfast. From our first day in an introductory PRI course we are shown that asymmetry because of in-utero development and positioning, brain hemispheric dominance, asymmetrical vestibular development, and internal anatomical differences is normal, expected, and predictable. Determining patterning that represents discord in the system then seems to be impossible until your realize that the skeletal system, is inherently symmetrical. Therefore there is no better way for a physical therapist to determine the state of the system as a whole than identifying asymmetries or patterns via our typical orthopedic testing. The brain processes and integrates all sensory inputs, internal and external, and generates behavior, including motor behavior, based on our perceptions with respect to the environment, emotional status, and previous experiences. I don’t think it’s unreasonable to consider that the ability to produce reciprocal and alternating movement is not only an effective measure of autonomic tone but also a key measurement of overall health.